This lovely fan is the most colorful and exotic fan in my shop! Great for those attracted to the Air or Water Element. 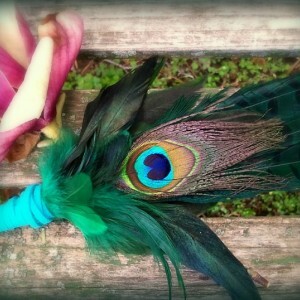 This listing is for one homemade smudge fan, which is also used as a ceremonial dance fan, or storytelling fan. (Smudge sticks are not included, but are available separately in my shop!) The feathers in this fan are cruelty free dropped feathers. This fan is a three-feather Pheasant and Hen-style feather fan. 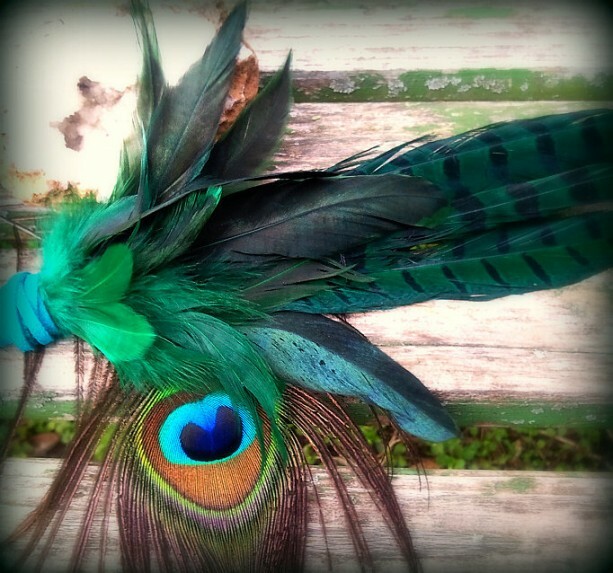 It has green and blue down feathers, and a decorative spray of cruelty free dropped guinea and hen feathers, in Cerulean and Prussian blue. 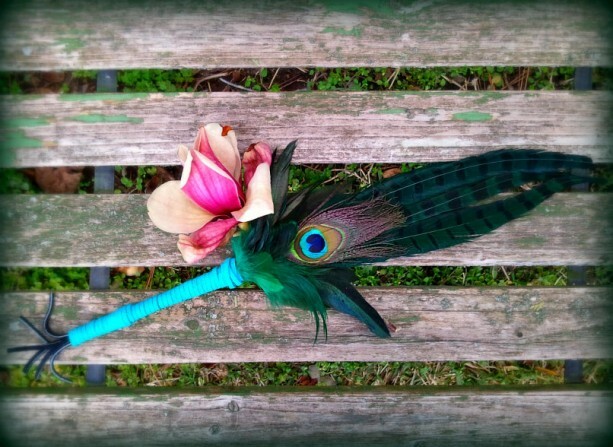 There is a single Peacock feather accent. The lacing is a cerulean blue suede, with a hand-cut leather black fringe decorative end. It is approximately 18" long, and 4" wide at the fan. Pheasant and Hen symbolism includes using ones gifts for success, expressing and protecting oneself, and being creative or productive, and tapping into that into yourself. Pheasant feathers symbolize passion, sexuality, creativity, flamboyance with good judgment, and the law of attraction. The Peacock is the "All Seeing Eye", and makes this fan great for divination or transmutation work. It is a well-balanced fan, and feels very lovely in your hand. Each fan is made to order, and each one is slightly unique depending on the character of the feathers. However, design will be as close as possible to this photograph, for each fan created. 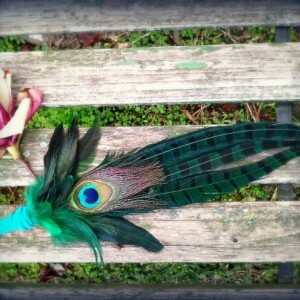 PLEASE VISIT: www.crueltyfreefeathers.com for more information on naturally dropped feathers. Lacings/Handles are made from buffalo, deer, or suede purchased from a yearly Pow-Wow celebration, from livestock grown on small, organic farms. The funds go to directly to support the Native American craftspeople that raise these animals for a living and for sustenance. I do not support cruelty of any kind to animals, nor do the merchants I purchase the wholesale supplies to make these fans. I also do not support using factory manufactured plastic leathers or chemically dyed feathers. PHEASANT/HEN FEATHER SYMBOLISM: The flamboyant, eye-popping colors of the male pheasant, reminds us that nature knows no end to its variety and creativity. Nature makes a way for these males to be very attractive to their female counterparts by design. Consequently their bright colors are perfect for wooing pheasant strumpets. Indeed, they are so effective, that males often have a harem of three hens at once. This is symbolic of creativity, sexuality, influence and magic. Why? Because females hold the gift of life (reproduction, creation of offspring), and the number three is a magical number that deals with the union of two to bring about the creation of another (male + female=progeny). Those with the pheasant as their totem have the same ability to attract love and creativity in their lives as the male pheasant does. These people have strong libidos and are able to attract a healthy amount of attention from those with whom they desire to partner. Further, those who resonate with the pheasant may be wild on the outside, but quite tenderhearted and conservative on the inside. The pheasant asks that we honor our genuine selves, and not pretend to be something we are not. This incorporates the symbolism of protection of our loved ones and ourselves. Just as the pheasant knows when to blaze their beauty, they also know when to hide in the shadows for as a defense. 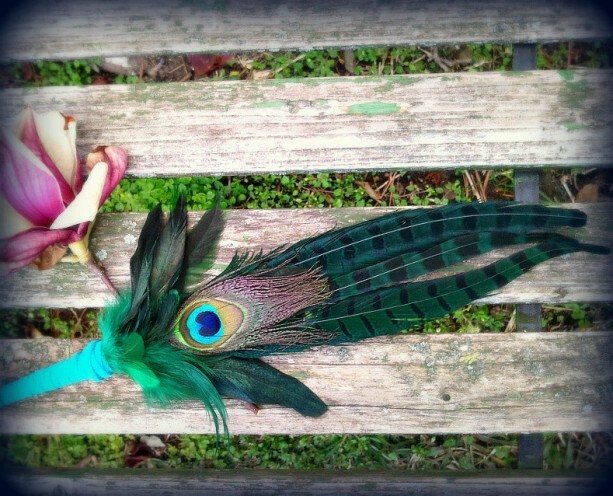 PEACOCK FEATHER SYMBOLISM: The peacock symbolizes beauty, enlightenment, and strength. Peacocks were often used to guard properties and castles, and are highly protective of their territory. 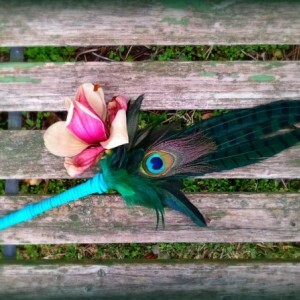 The eye in the feather is the "All Seeing Eye" and sees every detail of humanity. The colors of the peacock fan were important to Alchemists, as the "cauda pavonis" or "peacock tail" is one of the steps that correspond to the moment that the human soul, after many painful rebirths, would realize that all colors of nature also exist inside them. SMUDGE FAN USE: A smudge fan is used to fan a smudge stick (herb bundle) and keep it alight. It is also meant to waft smoke in the direction of the area, circle, person, or object you intend to smudge. Smudge fans are also used held in the hand for ceremonial dance, and along with rattles, also used in storytelling in the Native American tradition. The potent smell of fresh herbs burning is perfect for relaxing and purifying your home, bath, or sacred space. Not only is the scent and smoke clarifying, protective and rejuvenating, but the smudges themselves are beautiful to hang, smell, and decorate. Also great to light before meditation, yoga, baths, or reading. Smudge fans are also lovely to lie on tables, altars, hang on walls and used as décor for your home or sacred space. Smudging is a common way of purifying homes, ritual spaces, meditation and yoga spaces, tools, items, and people. 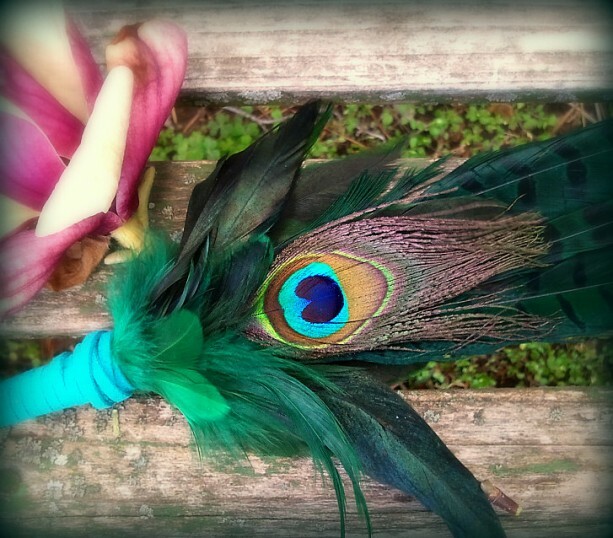 It is traditional to fan the end of the smudge stick with a feather or smudging fan, to keep the herbs lit, and the smoke flowing towards and around the area, item, or person you are smudging. Smudging is traditional in Native American culture and traditions, especially Shamanism. The binding of smudge sticks for many traditions was a sacred intentional process in and of itself. Using scent and scented smoke in rites of purification, whether through smudging (the process of using a smudge stick) or burning incense, is common in many traditional cultures around the world. Smudging is known to have medicinal and religious correlations to spiritual beings, invoking or repelling certain energies or intents, and it is a type of ritual that can be done before, during, and after prayer. SMUDGING RECOMMENDATIONS: Light the end of the smudge stick, thoroughly. Allow to flame for a moment, then fan the end with a feather or smudge fan. It is considered impolite to blow on the end of incense or smudge sticks. You may have to repeat this process, to get the stick to start smoking. Continuously fan the end of the stick, still or walking, and fan the smoke towards the person, space, object, or area you are wishing to purify or consecrate. Once finished, carefully place the end of the smudge stick into an earthen bowl, dry sand or dirt, a fire safe dish, or shell, and push firmly down until extinguished. Do not press too hard, or you’ll break the smudge. (It is much like snuffing out the end of a cigar or cigarette for future use.) Make sure your smudge is COMPLETELY out before leaving. You can hang your smudge stick, place on a table or in a sacred place, window ledge, or store in a container. Do not snuff out using water. It will damage the herbs, and promote mildew. It is perfectly acceptable to burn your smudge stick over and over until it is completely burned down. Ashes from your smudge can be saved to strew for purification as well, and ends of smudge sticks can be tossed in the ground to purify outdoor areas. PS-Quantities and availability of feathers vary from time to time. All items pictured besides the smudge fan are for display purposes only, and do not come with the item. Please note that there are import/export restrictions for feathers in some regions. If shipping is restricted, and you are unaware, I will contact you to cancel/refund your order with no penalties. I do NOT ship to New Zealand, due to import restrictions. I have been growing and drying herbs for over 20 years, and was taught how to cut, cure, and dry them by my Great-Grandmother and Grandmother. It's a family tradition! All herbs are pesticide free, and organically grown. Some herbs may be seasonal or have limited availability. Keep in mind that some people can have allergies either inhaling, eating, or coming into contact with herbs and plants. Please burn safely, and never leave burning herbs or candles unattended. Buyer must use caution and good sense with all herbal products. As the seller, I am not responsible for any injuries, damage, or medical reactions the buyer might have to herbal products. Be smart, safe, and blessed!